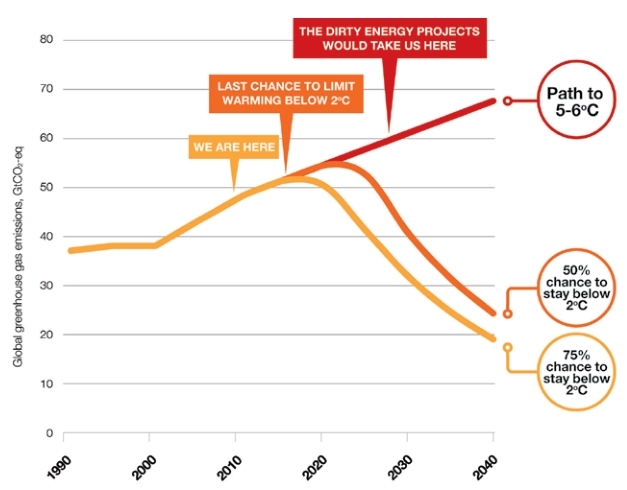 A new report by consultancy Ecofys for Greenpeace, called Point of No Return, details 14 proposed fossil fuel projects, dubbed “carbon bombs”, that would together effectively lock in dangerous climate change. If the 14 projects go ahead, they would add 6.3 Gt/year (greater than present US emissions) to global CO2 emissions in 2020, a 20% increase at a time when we urgently need to cut global emissions as fast as possible. They would add 300 Gt CO2 to the atmosphere by 2050, about a third of the carbon budget for 2010-2050 required for a 75% chance of avoiding 2°C of global warming, the level which the world’s governments have agreed to prevent. They would keep us on the business-as-usual pathway that leads to an unimaginably catastrophic 6°C by 2100. Thus it is imperative that these fossil fuels be left in the ground. Note the number for US shale gas emissions could be an underestimate depending on the rate of fugitive emissions. These projects are progressing because humanity is not limiting its demand for fossil fuels. 1,200 new coal-fired power plants are planned around the world, three-quarters of them in China and India. Coal-fired power is also resurging in Europe, partly due to the failure of the EU ETS, and partly because shale gas is forcing the US coal industry to shift from domestic consumption to exports. 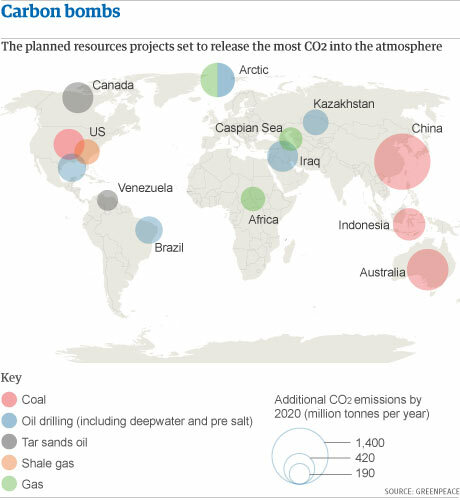 One thing that strikes me about the report is that in many of the projects listed above, the carbon will be mined in one place and burned in another. Currently, the climate policies of governments focus on constraining emissions within their borders. That is not enough in a world where UN negotiations have not only failed to agree on an international regime of national emissions targets adding up to a safe global target, but have even agreed to delay such an agreement until it will be too late. There needs to be much more attention given to constraining extraction of and global trade in fossil fuels. We have to stop “carbon bombs” from being mined in the first place. In the Australian context, we must abandon our plans to expand coal exports and instead start phasing them out.